An enormous Japanese dock that was cast out to sea by the tsunami last year has landed on an Oregon beach. While it is not the first piece of debris to reach the US, it has bought with it a veritable menagerie of ‘alien species’ that environmentalists fear could have a devastating impact on local ecosystems. The 66-foot dock dock originated from the Japanese fishing port of Misawa and during its year-long, 5,000 mile journey has picked up a host of sea creatures including Asian crabs, sea stars, algae, urchins, barnacles, snails, and other life-forms. In fact, there are so many creatures on it that the Oregon Department of Fish and Wildlife estimates they weigh over 100 tons! 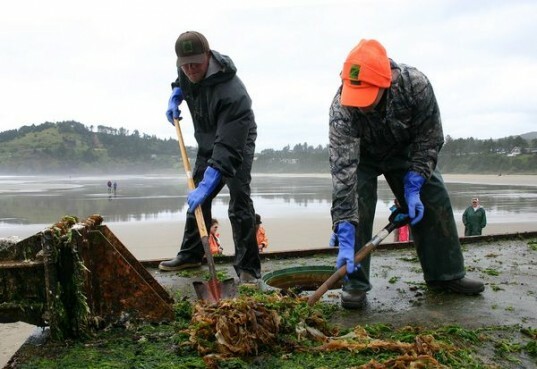 The Japanese dock has been likened to an “alien mother ship” full of invasive species that could pose a threat to the native wildlife of Oregon’s Agate Beach. To stop any long-lasting damage, volunteers from the Oregon Department of Fish and Wildlife have been using shovels, rakes and even fire to scrape the dock clean. While it is impossible to completely predict the impact the new species will have, Chapman believes they could out-compete native oysters and crabs and devastate the local economy. “On that dock probably 50 or more species that survived the crossing are not species that we’ve seen crossing the globe before,” Chapman said. 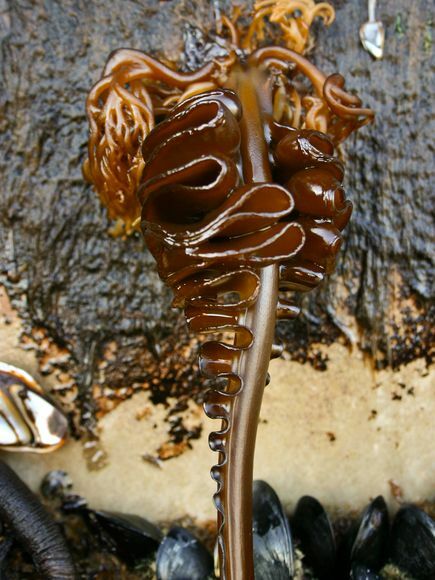 “And we’ve also already identified three real bad characters that were aboard.” The alien species include wakame seaweed and the Japanese shore crab, which has already invaded the US East Coast and decimated native shellfish populations. The dock is expected to be towed to Newport once it has been treated, where it will then be scraped. So far, it is estimated that some five million tons of debris were washed off Japan’s coast, and NASA is currently tracking 1.5 million tons of it. An enormous Japanese dock that was cast out to sea by the tsunami last year has landed on an Oregon beach. While it is not the first piece of debris to reach the US, it has bought with it a veritable menagerie of 'alien species' that environmentalists fear could have a devastating impact on local ecosystems.